Last night 400 Chrysler Dodge Jeep Ram welcomed over 100 women from Ripple of Kindness - Barrie where they raised a massive $50,000 that was split between the ALZ Association - Patients and Caretakers and Youth Haven Canada! 400 Chrysler Dodge Jeep Ram, your local dealership with a heart. The new Dodge Journey is a midsize SUV that is popular for its many outstanding features. In addition to robust engine power, the Journey also offers drivers the control of specially designed suspension components. Journey owners can choose between performance, touring, or normal suspension systems. Dodge Journey drivers who prefer a normal feel will appreciate the standard MacPherson strut equipped MultiLink suspension system. This MultiLink design helps to isolate bumps and create smoother driving experiences. 400 Chrysler Dodge Jeep Ram is pleased to announce that we are sponsoring a FREE Community Skate for all members of the community that would like to come out! You’ve worked hard for your money to be able to afford the new or used vehicle you have been looking at purchasing from 400 Chrysler. With all the time invested in researching the vehicle, going on a test drive, and finalizing the deal it is important to consider purchasing extended warranty to enhance your vehicle's mechanical coverage and offer peace of mind when behind the wheel. Why is this important, you ask? It is simple: these air extractors help allow the engine compartment to get more air and help it to cool itself much easier. 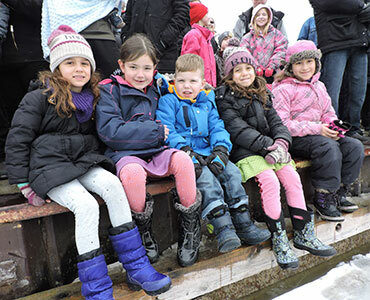 We are proud to be the Champion Sponsor of the Polar Bear Dip hosted by Innisfil Community Events Corporation. This year we are teaming up to raise money for the Innisfil Food Bank and the Health Hub in Innisfil. Help support the great cause by registering your own team or pledging for one on Saturday February 23rd, 2019 @ 1.30 pm at Alcona Beach. Are you a new or expecting parent? 75% of car seats are installed incorrectly. Could yours be one of them? Let us help you keep your child safe. After the popularity of our last Car Seat Clinic with St. John Ambulance, 400 Chrysler Dodge Jeep Ram has decided to host another FREE Car Seat Clinic for our community. Time slots fill up fast so please call (705)797-9700 to book your appointment today! While the event is free, donations for St. John Ambulance are welcomed. It is important to take care of the tires you purchased for your vehicle since they’re constantly being worn down. Maintaining your tires will increase their life, and end up saving you time and money in the future. It is important to protect your investment of new tires for you vehicle. Proper wheel alignment will play a crucial role in prolonging the life of your tires as well as important suspension components. Misaligned steering systems will cause uneven wear of your tires, along with steering problems such as the vehicle pulling to one side or vibrations. As we go into 2019, we want to thank all of our customer's, staff and families for their incredible support in 2018! Our involvement in the community is incredibly important as we are your local dealership with the biggest heart! We have some exciting events planned for 2019! Stay tuned for more announcements in our blog and on our social media pages! We look forward to looking after any of your vehicle sales or service needs!